Congratulations to the students selected by M/s. Pathfront, Bengaluru, during the campus recruitment exercise held on 26th March, 2019. Congratulations to the students selected by M/s. 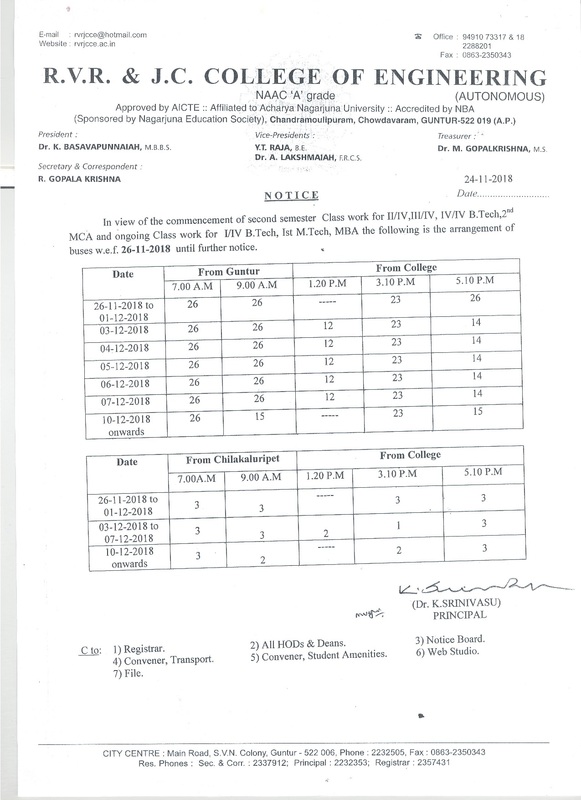 Chola MS General Insurance-"Murugappa Group", Vijayawada, during the campus recruitment exercise held on 27th March, 2019. 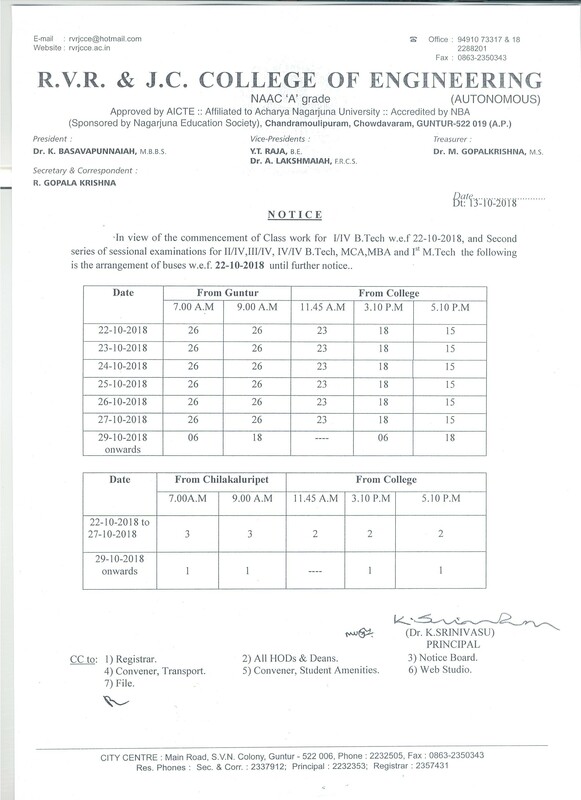 In view of commencement of 2nd Series of Internal Examinations notice regarding buses arrangement w.e.f. 29.03.2019. Congratulations to the students selected by M/s. Centilytics, Noida, during the campus recruitment exercise held on 29th January, 2019. Congratulations to the students selected by M/s. ICICI Bank, campus recruitment exercise held on 07th March, 2019. Congratulations to the students selected by M/s. VIVO, campus recruitment exercise held on 13th March, 2019. Congratulations to the students selected by M/s. Syntel, Pune campus recruitment exercise held during 09th-10th February, 2019. Click here to view the events/competitions that will be conducted on 15.03.2019(Friday). Congratulations to the students selected by M/s.Sri Sahin Tech Solution Limited,Hyderabad,campus recruitment held on 11thFebruary, 2019. Congratulations to the students selected by M/s.HSBC Software Development(India)Pvt.Ltd,Hyderabad,campus recruitment held on 12thFebruary, 2019. Congratulations to the students selected by M/s.Divis Laboratories Limited,Hyderabad,campus recruitment held on 27thJanuary, 2019. Congratulations to the students selected by M/s. Apollo Munich Health Insurance,Gurgaon ,campus recruitment held on 23rdJanuary, 2019..
Congratulations to the students selected by M/s. 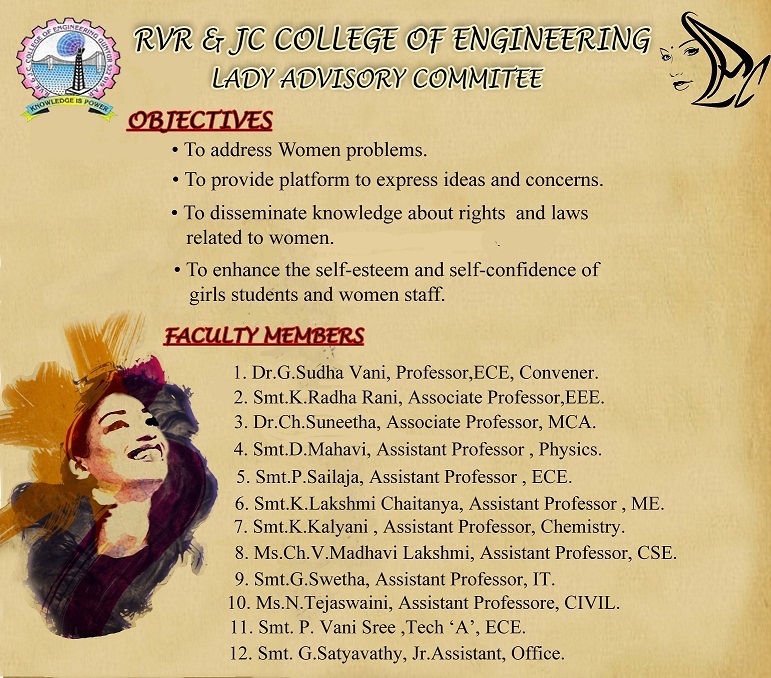 Ramky Enviro Engineers Limited,Hyderabad,campus recruitment held during 6th&7thFebruary, 2019. 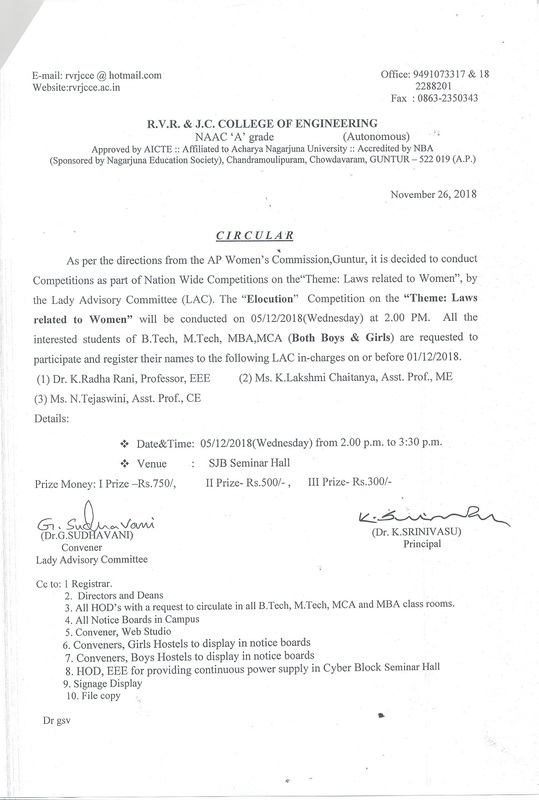 Notice regarding competitions in photography. Congratulations to the students selected by M/s. NTT DATA Inc, Bangalore during campus recruitment held on 31st January, 09th & 10th February, 2019. Congratulations to the students selected by M/s. Satyam Venture Engineering Services (SATVEN), Secunderabad, during the campus recruitment held on 06th-07th February, 2019. Congratulations to the students who are the winners of event Code A Thon 2019(A Programming Contest) conducted by Informatrix, Department of IT held during 24th-25th, January 2019. 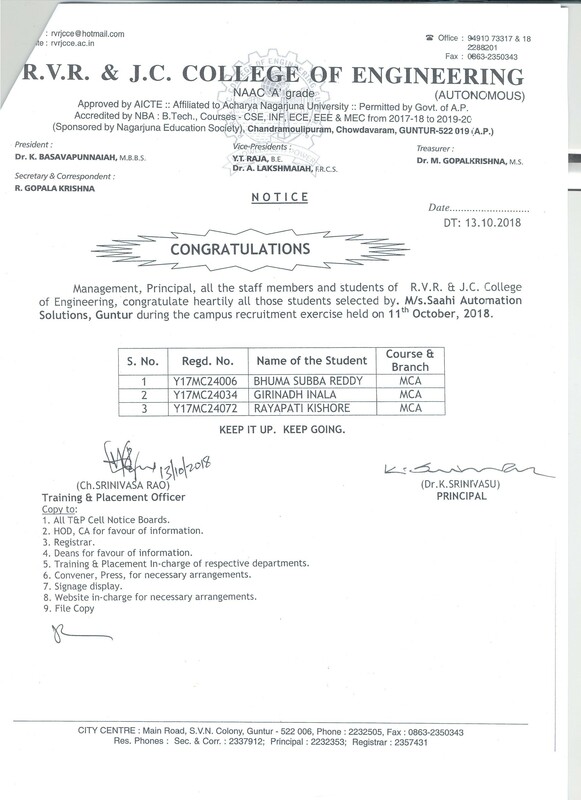 Congratulations to the students selected by M/s. Amara Raja Group, Hyderabad campus recruitment held on 24th & 25th January, 2019. Congratulations to the students selected by M/s. Aliens Group held on 27th December, 2018. Congratulations to the students selected by M/s. HCL, Hyderabad held on 09th January, 2019. Congratulations to the students selected by M/s. Wipro, Hyderabad held on 04th December, 2018. Congratulations to the students selected by M/s. CMS IT Services, Mumbai held on 04th December, 2018. Congratulations to the students selected by M/s. WESTLINE-GROUP, Ahmedabad, on 11th December, 2018. 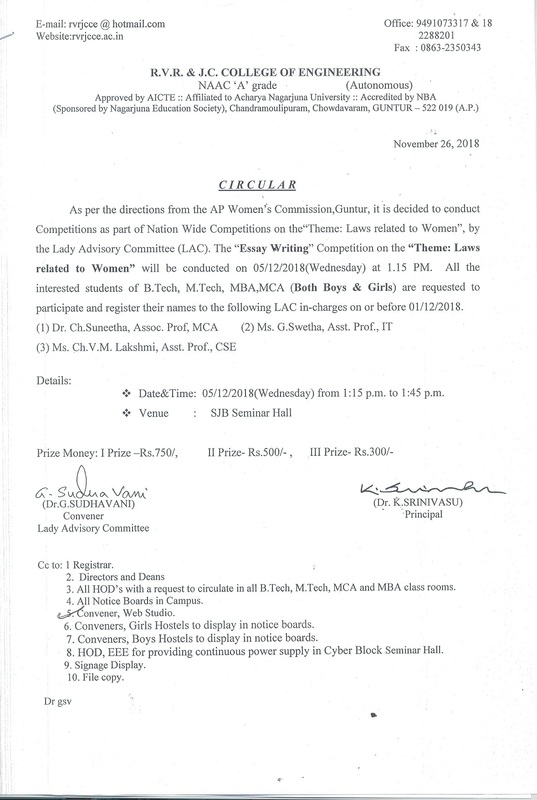 AP Women's Commission,Guntur is decided to conduct Competitions as part of Nation wide Competitions on "Theme:Laws related to Women"by LAC, for Essay Writing Competitions. Congratulations to the students who won the prizes in Essay Writing Competitions. Congratulations to the students selected by M/s. Hansa Solutions India Pvt.Ltd,Hyderabad,in campus recruitment execise held on 27thOctober,2018. Congratulations to the students selected by M/s.Infosys,Hyderabad,on 2ndNovember,2018 through #HackWithInfy contest. Congratulations to the students selected by M/s.MOBIS Technical Center India, Hyderabad "HYUNDAI Group "in campus recruitment execise held on 09th-11thOctober,2018. Congratulations to the students selected by M/s.ZenQ,Hyderabad,in campus recruitment execise held during 23rd-25thOctober,2018. 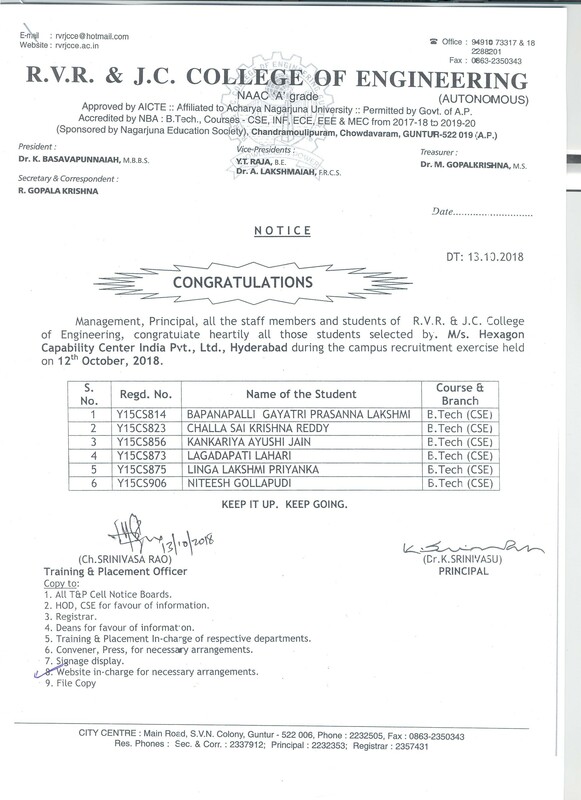 Congratulations to the students selected by M/s.Hexagon Capability Center India Pvt., Ltd., Hyderabad,in campus recruitment execise held on 12thOctober,2018. Congratulations to the students selected by M/s.Saahi Automation Solutions,Guntur during the campus recruitment execise held on 11thOctober,2018. RED ANTS in association with L&CC is going to conduct a workshop in "TERRAKOTA POTTERY" on 10.10.2018(Wednesday) from 11.00 a.m.to 4.00 p.m.
All the students of I/IV B.Tech,Ist M.Tech,MBA,MCA and 2nd year lateral entry students are informed that those who are not availing transport facility are required to submit Non bus user form on or before 29-09-2018(Saturday).